Born 8 March 1956 in St Mary's Archway, London [registered in Islington, March 1956]. Died 15 July 1989 in Madrid, Spain, aged 33 years 129 days [not registered in UK]. In a car accident. Club(s) After playing with Haringey Schools and South-East Counties schools, Cunningham joined Orient FC as an apprentice in August 1972, turning professional in March 1974 after being rejected by Arsenal FC. He played 75 league matches, scoring fifteen goals. He joined West Bromwich Albion FC in March 1977 for £110,000, playing 86 league matches, scoring 21, before a lucrative move to Real Madrid CF for £995,000 in June 1979. Injuries blighted his time at Madrid (44 league appearances, thirteen goals in five years), and was loaned out to Manchester United FC in March 1983 (five league appearances, one goal), and Sporting Gijon for the 1983-84 season (thirty league appearances, three goals). When he returned to Real, he was transferred to Olympique Marseille on a free transfer in 1984. After one season (thirty league appearances, eight goals), he returned to England with Leicester City FC on loan between October 1986 and May 1986, but injury continued to plague and limited his league appearances to fifteen. Cunningham returned to Spain and Rayo Vallecano, and his 37 appearances and three goals secured a move to Belgium and Charleroi in 1987. But once more, struck down by injury after only one match. By the end of the season, Cunningham had returned to England and Wimbledon FC (six league appearances, two goals). In the summer of 1988, he rejoined Rayo Vallecano, and his one goal in nineteen appearances was the goal that secured Rayo's promotion into the Primera Lega. It was to be his last ever football match. Player number One of two who became the 937th players (938) to appear for England. First match No. 529, 23 May 1979, England 0 Wales 0, a British Championship match at Wembley Stadium, Wembley, London, aged 23 years 76 days. Last match No. 548, 15 October 1980, Romania 2 England 1, a World Cup qualification match at Stadionul 23 August, Bucureşti, substituted (65), aged 24 years 221 days. Distinctions Generally regarded as the first Black Player to play for England, he was the first to wear an Under-21 shirt, and also to play competitively for England, six months after Viv Anderson's friendly appearance. The first black representative at any level belongs to Benjamin Odeje in 1971, when he appeared for five times for the England schoolboys. Tragically killed in a car accident in Madrid, Spain. - An English Football Internationalists' Who's Who. Douglas Lamming (1990). Hatton Press, p.82. - 526 29 November 1978 - England 1 Czechoslovakia 0, Wembley Stadium, Wembley Fr HW squad/unused? - 527 7 February 1979 - England 4 Northern Ireland 0, Wembley Stadium, Wembley ECP HW squad/unused? - 528 19 May 1979 - Northern Ireland 1 England 2, Wembley Stadium, Wembley BC AW squad/unused? - 530 26 May 1979 - England 3 Scotland 1, Wembley Stadium, Wembley HW squad/unused? - 531 6 June 1979 - Bulgaria 0 England 3, Natsionalen Stadion Vasil Levski, Sofija ECP AW squad/unused? 3 533 13 June 1979 - Austria 4 England 3, Praterstadion, Wien Fr AL sub 70 ? 5 538 26 March 1980 - Spain 0 England 2, Nou Estadi del Futbol Club Barcelona, Barcelona Fr AW sub 77 ? Exactly 20 years ago, on 15 July 1989, one of the most remarkable careers in English football history came to a sudden and tragic end in a car crash on the outskirts of Madrid. Laurie Cunningham was only 33 when he died and spent most of the peak years of his career playing abroad. But what he did on the pitch, and the changes he helped bring about off it, left a lasting impact on the English game. Rejected by Arsenal, he began his professional career at Leyton Orient in 1974 and within five years he became the first Englishman to play for Real Madrid. His amazing journey from Brisbane Road to the Bernab�u went via West Brom, where the winger became the first black player capped by England at any level and, along with defender Brendan Batson and striker Cyrille Regis, formed the legendary 'Three Degrees' partnership. Under manager Ron Atkinson, the trio - nicknamed after the American soul group - inspired the Baggies to one of the greatest eras in their history. "At that time, for a short spell I reckon we were the best team in Europe. We didn't put any restrictions on Laurie - I just told him to get the ball at his feet and go and do damage with it. For that 1978-79 season, especially around the time when we beat Valencia in the Uefa Cup, I've never worked with a better player. I had Bryan Robson for years and at Atletico Madrid I had Paulo Futre, who was a European footballer of the year, but Laurie could live with any of those." Cunningham, Regis and Batson were outstanding in both senses of the word - English football fans had never seen three black players in a top-flight team before and the trio produced some stunning performances. Regis still takes great pride in what they did together at West Brom, silencing the racist crowds that were commonplace in English football in the 1970s. "Players like Justin Fashanu, Luther Blissett and Garth Crooks were coming through at that time but what happened at West Brom was radical, three black guys in one side was incredible. There were lots of stereotypes then about black players - that we couldn't handle the cold weather, that we were all flair and didn't have the right temperament - and when you've been brought up in London in that time, as we were, you certainly know you're different. We couldn't do a Cantona and jump into the crowd, so instead you thought 'I'll hurt you with my ability'. There was a massive sea change among managers too, people like Graham Taylor, David Pleat and John Bond. They said 'these black guys can play'." And Cunningham showed how much he could play in a Uefa Cup tie against Valencia on 6 December 1978, a game that changed his life. "That was the game that everyone remembers. He was electric, it was 90 minutes of sheer class. Everything went well - that performance captured whoever was looking for Real Madrid and sold him to the club." Later that season Cunningham won the first of his six England caps and in the summer Madrid came knocking. Negotiations took place at Atkinson's house, in an endearingly amateurish sounding set-up a million miles away from the wheeling and dealing world of galactico transfers of the modern era. "We had our chairman Bert Millichip there and Madrid had their president there. They started bidding at £250,000 and we started at £1.5m - nobody spoke the same language except for the translator so we would write a figure on a piece of paper, show it to them and they would cross them out and put in their offer. That's how we did it. When they offered £250,000 my dog barked and I told them 'look, even the dog knows that's not right'." Eventually a fee of £950,000 was agreed and, aged 22, Cunningham left the Hawthorns for Madrid. For all parties, things would never be the same. "It was a fantastic thing for him to achieve, to play for Real Madrid, but it was sad too because West Brom had a fantastic chemistry. That was the start of their demise. Two or three years later Bryan Robson left, then Remi Moses did - I don't think the club has ever been the same." Initially, life in Spain was good, with Madrid winning the League and Cup double, and reaching the 1981 European Cup final, where they lost to Liverpool. But injuries began to take their toll on Cunningham and without an agent or anyone to look after him the psychological knocks seemed to have as much of an affect as the physical ones. "If you are used to producing 10/10 performances, it's hard to keep up those levels. People knew Laurie could produce 11/10 displays and wanted to see it, so when he couldn't do it and wasn't consistent, it was very frustrating for everyone." 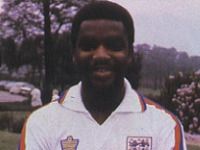 After four years at the Bernab�u, in 1983 Cunningham was reunited with Atkinson, now manager of Manchester United, when he went to Old Trafford on loan. "We were open-minded about signing him permanently and he would have played in the 1983 Cup final but he failed a fitness test the day before. We only had one substitute then, which made a difference. If we'd had a few, he could have started and if it had gone wrong, we could have put someone else on." After leaving Madrid at the end of the 1982-83 season, the thoroughbred Cunningham began a spell as journeyman player, having short-term spells with a variety of teams around Europe before finally getting his chance in the FA Cup final - with, of all teams, the Crazy Gang of Wimbledon in 1988. "Their style was as far away from his as you could get and it shows how far his career had gone down. He was so full of flair and ended up playing for the original long-ball side - it was a far cry from playing for Real Madrid against Barcelona to be playing at Plough Lane." Cunningham's second-half substitute appearance in the Dons' 1-0 win over Liverpool proved to be his farewell appearance in English football before he ended up back in Madrid, playing for second division Rayo Vallecano. He scored the goal that clinched their promotion to the Primera Liga and it was shortly afterwards that Atkinson saw him for the final time. "I went out with him and the Vallecano president. He was saying how he was going to light up the Bernab�u next season and show Madrid what they had missed out on. A month or so later, he was dead." Regis, who had survived a similar car crash with Cunningham a few years earlier, was shaken to the core by his death. "When you look at your best friend, whose life has in many ways run parallel to yours, and he goes and all his money, cars, houses and things are left behind, it makes you question life, so about 15 months later I became a born-again Christian. I have a lot to say thank you to him for." The scarcity of internet footage of Cunningham means younger fans wondering just how good he was have to rely on comparisons from those who knew him. Atkinson likens him to Barcelona's former Arsenal striker Thierry Henry, while Regis says Cunningham reminds him of another more recent Real Madrid summer signing. "Laurie was like Cristiano Ronaldo in the way he used to take people on. He had his style, his grace and his pace. He ran on his toes, he was balletic with his amazing tricks and pace." Twenty years on, he clearly still misses him as a friend and as a footballer. And although a paltry six England caps would suggest Cunningham did not entirely fulfil his own promise, he left a legacy more enduring than only a list of statistics and memories. "I see him as never realising his potential. But talk to the second generation black players who came after us, people like Ian Wright, and they will say when they saw people like Laurie on the pitch, they thought 'if he can do that, then so can I'." - By Julian Shea - BBC Sport (15 July 2009).